Looking for Graduation inspiration? You're in luck, because today's Bloggers Challenge Theme is Graduation, just in time for the start of Graduation parties! I've got a couple graduations to attend this summer, so I know I'll need a few creative ideas for the cards I'm giving. For my card, I'm using some "new to me" creative tools! This past week I added to my embossing folders by purchasing a bunch of the new Texture Fades Folders created by Tim Holtz for Sizzix. I used the Notebook Folder on White card stock, punched the edges with the Spiral Punch, added some highlights with Old Paper Distress Ink, then distressed the edges with the Distrezz-it-All. 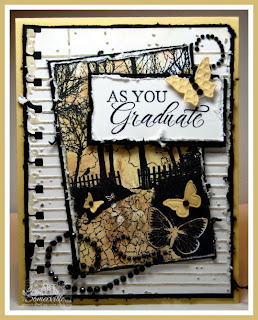 The main image and sentiment are from Our Daily Bread Designs As You Graduate set. For the main panel, I used the Antique Glimmers Technique then distressed the edges, layering on a Black distressed panel. I added a few butterflies from Stampin' Up! 's Beautiful Wings Embosslit along with some Black Gems as embellishments. The inside of the card reads "Never be afraid to trust an unknown future to a known God", this sentiment is same ODBD set. Need more inspiration, click on the Bloggers Challenge Logo on my sidebar to see what the other Designers created this week. I not only love the outside -- the notebook page is fabulous -- but the sentiment is absolutely perfect! I may have to steal it to just write it into some of my cards! Love this card! I love that notebook paper with the punched holes. Very neat card! I'm next in line, luvin' it too! The ef is grrrreat! as are the punched holes...That set is just perfect, so different, and so right on. Beautiful! This is lovely, Lisa! My son is graduating this year and I made his open house announcements (what was I thinking!). Now I have to make a bunch of graduation cards for his friends. Thank you for the inspiration! Oh wow! This is AWESOME!!!! I love all the details on this card, and I just love everything!!!!! Ecellent job!!!! OMG! Lisa that is a fantastic Grad card! Wish I had that punch and folder!!! I love the butterfly addition and may use that! I need one for tomorrow! Such a beautiful card with a wonderful sentiment. Love how you used the texture fad folder for the background and the image and embellishments are beautiful together. Wow! What a gorgeous card. Love the notebook embossing folder. Everything about this card is wonderful. Everything about this is just fabulous! It's pretty funny that today's challenge is Graduation,and I posted a grad card... LOL Your card is stunning, I love the mix of textures you've got going here. Beautiful job! Fantastic card- I love all of the details! I love the notebook punch and the embossed BG- the stamp is beautiful! Wow! Wonderful card!! I love all the detail and the textures in this card!! Lovin that notebook paper texture plate! Such a GREAT card! Oh my!!! I LOVE those plates!!! I really like how you used it on this one and the pathway stamp is a perfect one for grad. Fantastic card! Lovely, Lisa! Perfect elements for a graduation card. This card makes me wish I was graduating so that I could be the recipient of it! Love the distressing and those plates are to die for!! What a lovely...and creative...grad card this is! Love the symbolizm of the stamp. Looks fabulous against that EF. Gorgeous card! Love the background and the main image. What a perfect embossing folder! Thanks for the link too - going to check it out. Great colors. Feels very grown up.